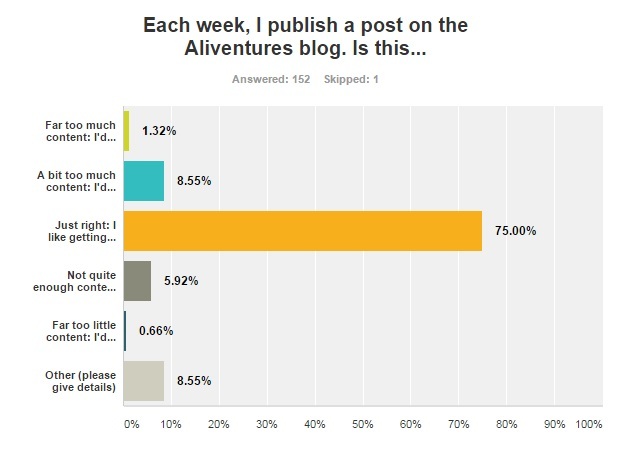 A huge thanks to everyone who took part in the recent Aliventures survey. It’s been really helpful for me to learn more about you, your writing, and what you’re working on (or struggling with) right now. I thought you might like to see the overall results … so here they are! My main surprise here was that so many Aliventures readers have worked on (or are working on) short stories. 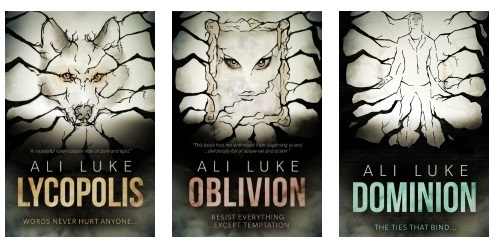 I don’t cover short story writing much – though I have tackled a couple of questions in the Aliventures newsletter recently about it. If you’re a short story writer and there’s a particular aspect of short story writing you’d like me to cover on the blog, do leave a comment below (or drop me an email – ali@aliventures.com). I was impressed by the number of readers who’ve already self-published or traditionally published, and by the numbers planning or seriously considering self-publishing. 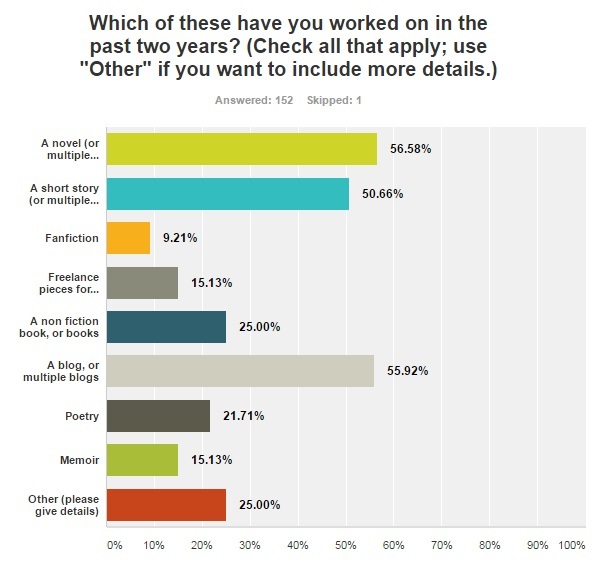 I realise I should’ve included blogs in this question (a couple of people mentioned them under “Other”). A blog is a form of self-publishing: you’re putting your words out there in the world for anyone to read. 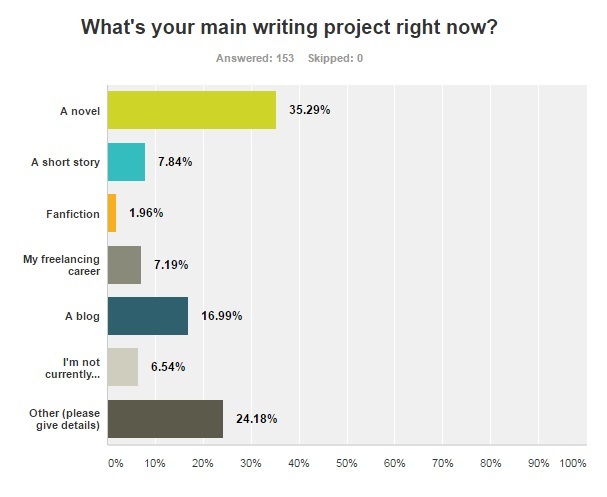 #3: Novels are the Most Popular Main Projects … but There’s a Huge Range! 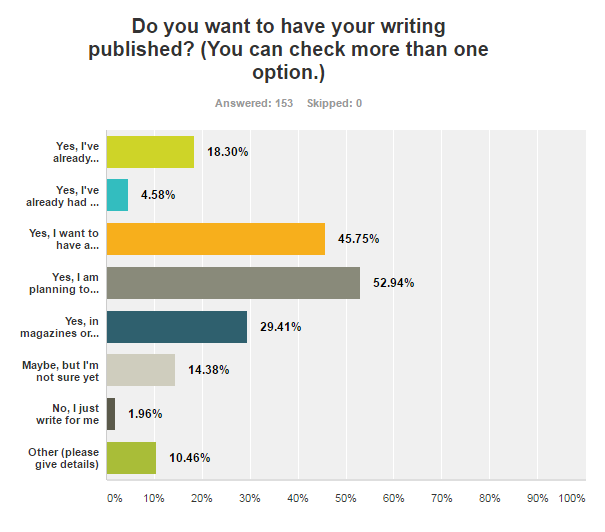 I’d expected a fair number of novelists amongst the Aliventures audience – as it turns out, over a third of you are working on a novel as your (current) main project. Quite a few of the “other” responses were from people working on a non-fiction book (which I should have thought to include in the list of options). Other responses here included memoir, journals, personal essays, comedy sketches and a PhD thesis. You’re a versatile bunch! I was struck by the sheer range of responses here, though given the diversity of main projects underway, it’s understandable that some people have been plugging away at theirs for longer than others. As you’d probably expect, people working on longer projects (e.g. a novel) tended to have spent longer than people working on shorter ones (e.g. a short story). If you’ve already written a novel, or if you’re a way through one, I’d love to hear in the comments how long it took you to complete it (or how long you expect it to take). Fully 50% of people said something along the lines of “I don’t have enough time” or “I’m not using my time effectively enough”. From past surveys, from talking to writers, and from my own experience, I’d expected this to be a fairly common theme. 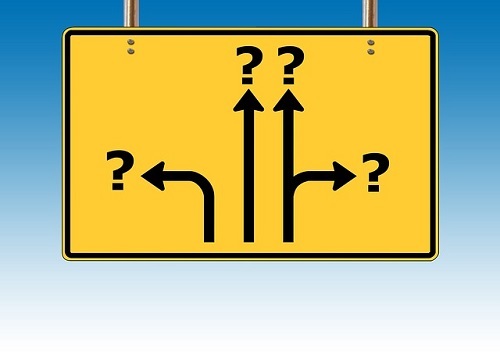 Ideas (either too few or too many) and motivation were other key issues. I’m hoping to create some helpful resources – including a webinar in a few months – to particularly tackle issues surrounding time and writing. If there’s a particular question you’d like me to cover within that, or if you just want to vent about your struggles with finding time to write, just pop a comment at the bottom of this post (or drop me an email, ali@aliventures.com). 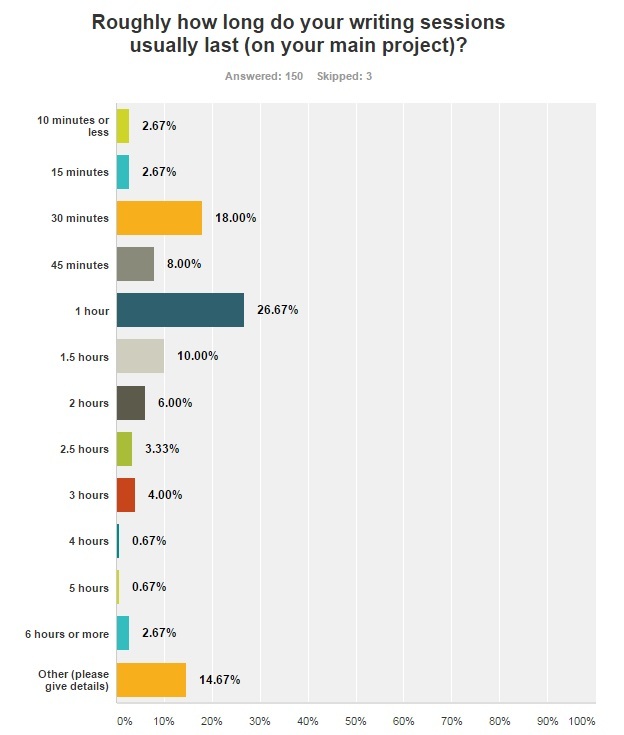 Over 60% of readers worked on their main project somewhere between once a day and once a week. Under “Other”, a number of people mentioned having an off and on schedule – working several times a week when inspired but with long gaps. I have to admit this is how my novel writing has often happened too. #7: Writing Session Lengths Vary Wildly! I don’t think there’s any perfect length for a writing session, but I was keen to find out what your writing schedules normally look like. Hour-long writing sessions were popular, followed by half-hour sessions; I’m impressed by the people writing for six hours or more! 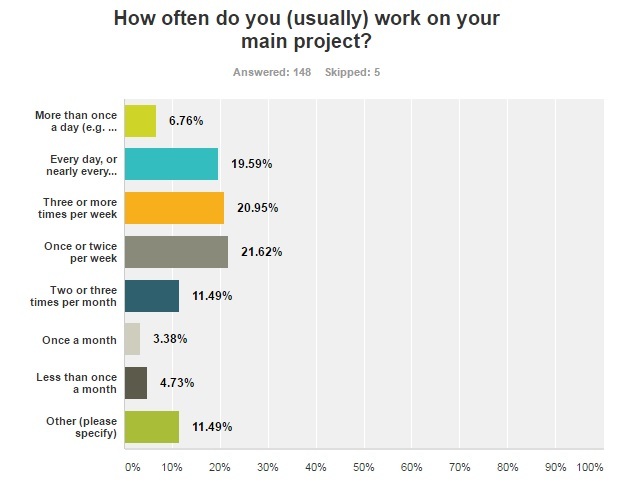 Under “Other”, quite a few people had very different session lengths depending on how the work itself was going, or what other commitments they had (e.g. childcare) on any given day. Rather to my relief, the vast majority of you are happy with weekly posts. Some of you wanted a bit more and some a bit less. Some of you, under “Other”, were kind enough to say that you didn’t mind how much I post, you’d read whatever I write! You’ll be unsurprised to hear that I’m sticking with weekly posts for now. 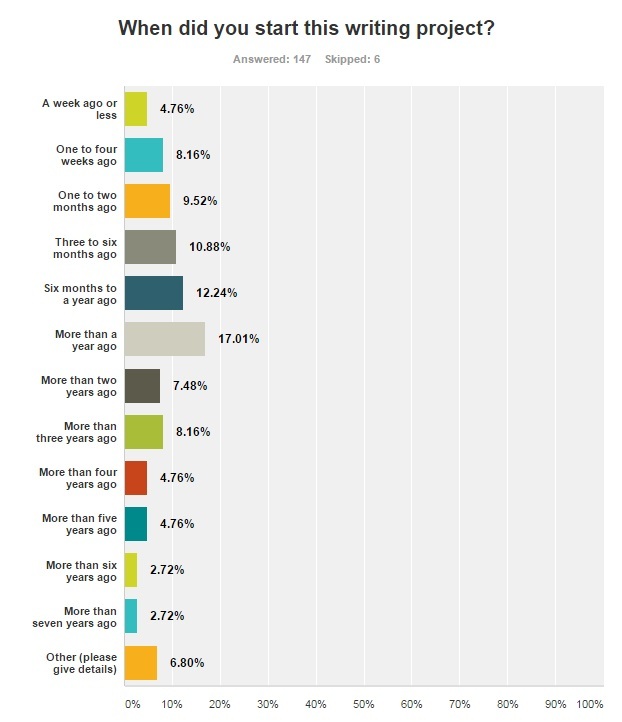 Again, I was relieved to hear that most of you are happy with weekly emails. This was what I’d expected (and hoped!) 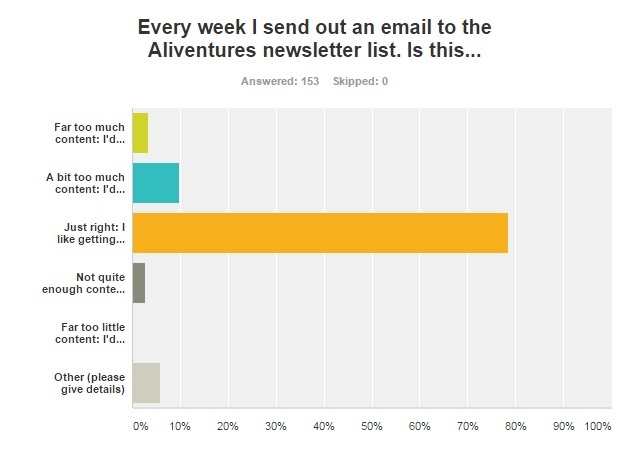 because when I surveyed the Aliventures readers a few years ago, “weekly” was the most popular option for the email newsletter. 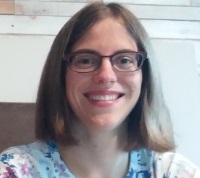 There were so many fantastic responses to the question “What topics or questions would you like to see me cover on the Aliventures blog/newsletter?” – thank you! The ground covered in your responses here was huge: everything from the techy side of blogging to querying agents to world-building to being organised. I’ll be tackling many of them over the next few weeks and months. Big thanks to everyone who took part. If you left your email address (or emailed me afterwards with it), then you should’ve received your copy of Seven Quick Ways to Boost Your Energy and Focus When You Sit Down to Write. If you didn’t get it, just drop me an email (ali@aliventures.com) and I’ll send it on to you.